A Portland man suffered serious injuries after his involvement in two accidents on Friday, September 4. After fleeing the scene of the first accident, the driver was then involved in a one-car rollover accident that sent him to the hospital with life-threatening injuries. The second accident closed the highway for approximately three hours while police investigated the scene. Jabril Mohamud was driving a Hyundai sedan when he crashed into another vehicle on Exit 7 northbound ramp. The 30-year-old fled that scene, heading onto Interstate 295 where he was traveling north in a southbound lane. Around mile marker 7, Mohamud’s vehicle became airborne and landed on the roof, trapping Mohamud inside until emergency personnel could free him. Mohamud was taken to Maine Medical Center, where he was listed in critical condition. Police have offered no details of the first accident, according to a report at the Bangor Daily News. There have also been no follow-up reports to state whether Mohamud was under any sort of influence when he was behind the wheel, if he was wearing a seatbelt at the time of the second accident or if he has been released from the hospital. Rollover accidents are particularly complex and violent in nature, according to the National Highway Traffic Safety Administration. These crashes tend to have a higher fatality rate than other types of car accidents, accounting for 35 percent of all deaths from passenger vehicle crashes even though rollovers only make up around two percent of all the accidents that occur. The large majority of rollovers are single-car crashes. Many of the deaths that occur during rollovers can be attributed to motorists failing to wear proper restraints. In 2013, around half of all Maine motorists killed in vehicle accidents were not wearing seatbelts. This number was a bit higher than many other states around the country and may be attributed in part to the fact that most Maine accidents occur on rural roadways, where motorists tend to be more lax about seatbelt use. Overall, Maine motorists were observed by the Maine Bureau of Highway Safety as wearing seatbelts approximately 84 percent of the time in 2012, the last year with data on the topic. That number has been steadily increasing since 2006. Motor vehicle accidents can have a lasting impact on victims and their families. 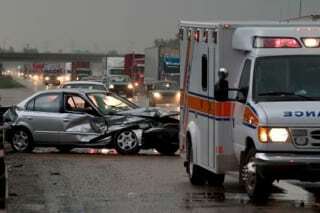 In some cases, serious injuries that occur during the crash can affect the accident victim for a lifetime. In other cases, tragedy strikes and fatality occurs, leaving family and friends grieving for the loss of a loved one. Lives can be changed in an instant, and in some cases it can be very difficult for victims and their families to rebuild after the devastating event. At Hardy Wolf & Downing, we work with accident victims daily, helping them pursue justice and legal compensation for their injuries and losses. Our team of Maine car accident attorneys is ready to help you get the compensation you desperately need to pay medical bills and make up for lost wages due to days off work. We offer free case evaluations and legal advice to those wishing to put their lives back on track. To learn more or get the legal help you need today, contact Hardy Wolf & Downing at 1.800.INJURED.